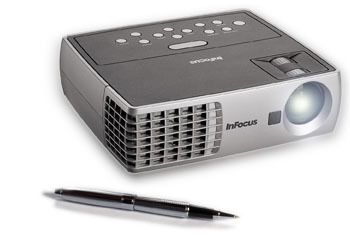 The InFocus IN1100 projector series is designed for teams that want it all - mobility, performance, and ease-of-use. With DisplayLink™ USB connectivity the IN1100 series takes seconds to set up & project and uses a much smaller cable. 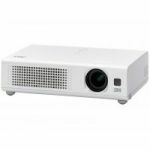 Utilizing filter-free, zero maintenance DLP® with BrilliantColor™ technology, the IN1100 brings superior visual performance to any meeting space. At a mere 2.75lb and 2400cc, the lightweight & compact nature of the IN1100-series makes it easy to move between floors and easy to travel with. With a much smaller footprint than a piece of notebook paper, every tabletop has room for this projector. The IN1100-series provides vivid colors and ample brightness. 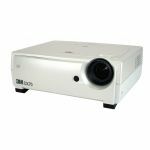 DLP® with BrilliantColor™ technology offers true-to-life color reproduction with up to 2200 lumens and an 1800:1 contrast ratio; a trifecta other mobile products cannot match. Leveraging high speed processing the IN1100 series accepts WUXGA & 1080p high resolution content. Additionally, the IN1100-series offers XGA and WXGA native resolutions to perfectly display from 4:3 or 16:10 widescreen computers. Plug-in, power-on, project. 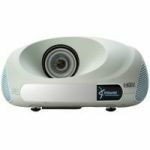 The IN1100-series is the first projector to utilize DisplayLink™ technology to eliminate the need to resize computer screens or toggle function keys when setting up an IN1100 series projector.